Machu Picchu Machu Picchu was built around 1450, at the height of the Inca Empire. 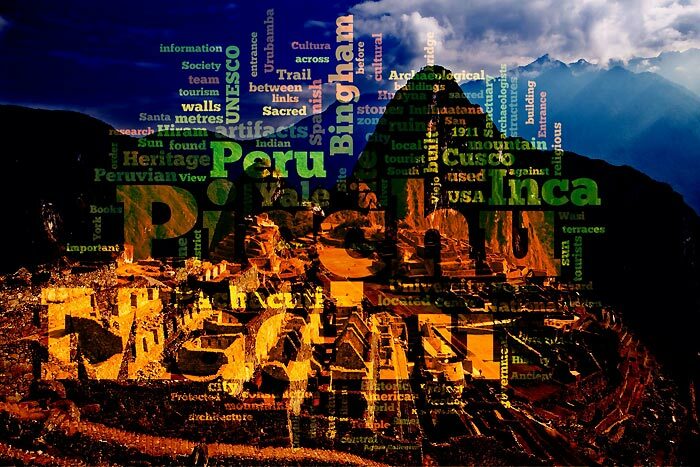 The construction of Machu Picchu appears to date from the period of the two great Incas, Pachacutec Inca Yupanqui (1438–71) and Tupac Inca Yupanqui (1472–93). It was abandoned just over 100 years later, in 1572, as a belated result of the Spanish Conquest. It is possible that most of its inhabitants died from smallpox introduced by travelers before the Spanish conquistadors arrived in the area. Design a beautiful word cloud in seconds on the iPad. Simply give Cloudart some text from a web page or paste some into the app and it will automatically create a gorgeous word cloud. Download on the App Store: Cloudart - Richard Wilson. Just with a few taps, create professional grade superimposed or juxtaposed photos on your iPad or iPhone! You don't need a computers and expensive software to superimpose or cut/copy/paste one photo on top of another any more. Download on the App Store: Superimpose - Pankaj Goswami. Word cloud or tag cloud (or weighted list in visual design) is a visual depiction of user-generated tags, or simply the word content of a site, used typically to describe the content of web sites. Tags are usually single words and are typically listed alphabetically, and the importance of a tag is shown with font size or color. Thus both finding a tag by alphabet and by popularity is possible. The tags are usually hyperlinks that lead to a collection of items that are associated with a tag.